The past few weeks, highlighted by the Business & Climate Summit in Paris and Carbon Expo in Barcelona, has seen many CEOs, senior political figures and institutional leaders call for increased use of carbon pricing. This is certainly the right thing to be saying, but it begs the question, “What next?”. Many countries are already considering or in the process of implementing a carbon pricing system, but still the call rings out. While uptake of carbon pricing at national level certainly needs to accelerate, one critical piece that is missing is some form of global commonality of approach, at least to the extent that prices begin to converge along national lines. To support progress towards these outcomes, our companies would like to open direct dialogue with the UN and willing governments. The request is very clear – this isn’t just a call for more, but a call to sit down and work on implementation. The CEOs noted that their companies were already members of, amongst other bodies, the International Emissions Trading Association (IETA). IETA has been working on connection of (linking) national systems for well over a year (although the history of this effort dates back to the days of the UNFCCC Long Term Cooperative Action – LCA – workstream under the Bali Roadmap) and I am co-chair, along with Jonathan Grant of PWC, of the team that is leading this effort. Late last year IETA published a strawman proposal for the Paris COP, suggesting some text to set in place a longer term initiative to develop an international linking arrangement. I spoke about this at length to RTCC at Carbon Expo in Barcelona. The strawman is what it implies, an idea. It could be built on to develop a placemarker in the Paris agreement to ensure that the framework mentioned by the six CEOs actually gets implemented in the follow-up from Paris – as the CDM was implemented in the follow-up from Kyoto. From my perspective, this week wasn’t just about carbon pricing, but also about climate science. On the same day that the FT published its story on the letter from the oil and gas industry CEOs, The Guardian chose to run a front page story implying that I had tried to detrimentally influence (apparently being a former oil trader!!) 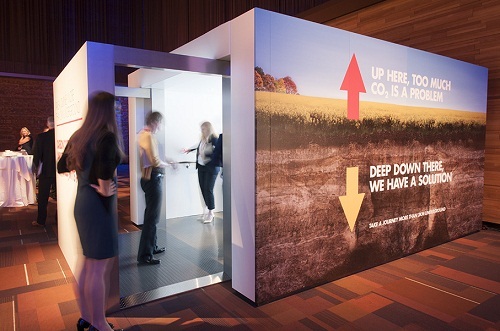 the content of the London Science Museum’s Atmosphere Gallery, a display on climate science that Shell agreed to sponsor some years ago. The reporter had based his story on exchanges between Shell and the Science Museum staff when the gallery was looking to do a recent refresh. 5. Offer the use of the Shell “CCS Lift” (an audio-visual CCS experience) to help explain this technology to the gallery visitors. My pitch to The Science Museum was that this approach offered a real opportunity to feature the Science Museum and the Atmosphere Gallery in the very public discussion on carbon budgets, get some good media attention in the run-up to Paris 2015 (e.g. through the very visible counter), tell the CCS story in context (the Myles Allen video and the CCS audio-visual display) and raise awareness of the cumulative nature of the problem (i.e. the science). In the end they decided not to use this material, but I stand by the proposal.